1. For precise positioning of the tip over the point of interest and for direct real-time observation of sample scanning and modification (nanomanipulation) processes. 2. 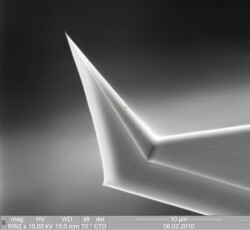 For precise positioning of a tightly focused laser spot at the tip end - for investigations of optical effects between tip and sample (TERS, TEFS, s-SNOM etc). (TOP VISUAL probe is under the investigated sample). Topography image of the sample made by TOP VISUAL probe.